2016 forecast of new car sales to reach 156,181 and projected 1.3 Billion for the Exchequer. The Society of the Irish Motor Industry (SIMI) today issued their first Quarterly Motor Industry Review in association with DoneDeal for 2016. The SIMI/DoneDeal report highlights the progress that the Motor Industry has made so far this year while presenting an outlook for the coming year. The key drivers of new car sales look set to remain positive, with the current momentum of the Irish economy strong, employment set to increase, improved earnings and consumer confidence remaining positive. 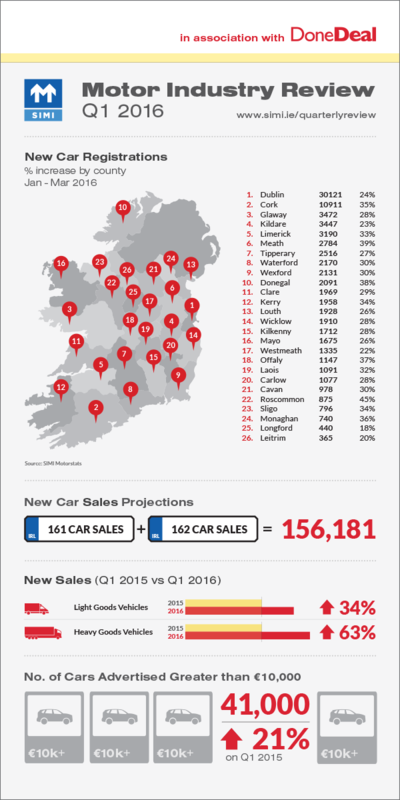 Figures from DoneDeal, Ireland’s most popular motoring site, mirrored the growth rate seen in the Motor Industry, with their car section advertising volumes increasing by over 11% on the same quarter last year, with a total advertised value of over €1.4 Billion in the Motor section alone for Q1 2016. Cathal Cremen, Commercial Manager of DoneDeal’s Motor Section, said: “With 260,534 motor ads published on DoneDeal.ie in the first quarter of 2016, the site continues to strengthen its position as the online platform of choice when it comes to the buying and selling of cars for both private individuals and professional dealerships. The review also highlights that the cost of motoring in general has decreased with the price of new cars down on average 2.8%, Petrol prices have declined by 11.1% and Diesel prices also declined by 17.7% in contrast the cost of motor insurance is increasing at a significant pace have again increased by 32.4% in the first quarter of 2016.